At below freezing point the kinetic energy of molecules is very minimum. At 50 C the kinetic energy of molecules is equal to the attraction of the molecules. At 120 C the kinetic energy of molecules is greater than the attraction of the molecules. Dipole–dipole force exists between all molecules that are polar. Polar molecules have electron-rich regions (which have a partial negative charge) and electron-deficient regions (which have a partial positive charge). Dispersion forces are the result of fluctuations in the electron distribution within molecules or atoms. What is the greatest contribution to the energy of interaction between different water molecules. Hydrogen Bonding is the strongest among dispersion (London) , dipoles forces. What is the greatest contribution to the energy of interaction between different Ar atoms. London forces are the result of fluctuations in the electron distribution within molecules or atoms. What is the greatest contribution to the energy of interaction between different ammonia, NH3, molecules. Arrange the following molecules from smallest to greatest London forces: Br2, Cl2, and I2. atoms of higher molar mass generally have more electrons dispersed over a greater volume. Arrange the following molecules from lowest to highest melting point temperature: Br2, Cl2, and I2. a. because the London forces increase as the molecules get larger or the number of electrons increases. b. due to hydrogen bonding. c. due to dipole-dipole forces. All but one of the following statement is true. Using your everyday experience, check the false one. a. Evaporation takes place from the surface of water. b. A cup of soup in a bowl cools more slowly than a cup of soup on a large plate. c. Hot water evaporates from a pan faster than cool water. d. Water evaporates as a gas or vapor. e. The vapor pressure of room temperature water in a sealed glass continues to rise until the glass breaks. f. The vapor pressure of room temperature water in a sealed glass reaches an equilibrium vapor pressure, that is, the evaporation rate of water equals its condensation rate from the gas phase. Which of the following statements are true about evaporation for a liquid? a. Only the most energetic molecules evaporate. b. This means the average kinetic energy of the remaining molecules decrease. c. This has no effect on the average kinetic energy of the remaining molecules. d. Consequently, the temperature of the remaining liquid drops, that is, evaporation is a cooling process. e. Consequently, the temperature of the remaining liquid stays the same. Only the most energetic molecules evaporate. Average kinetic energy of the remaining molecules decrease because the energetic molecules with more velocity have evaporated. Therefore the molecule in the liquid has less velocity. At what temperature is the equilibrium vapor pressure of water about 100 torr? At what temperature is the equilibrium vapor pressure of water about 400 torr? If atmospheric pressure were 600 torr, at what temperature would water boiling? Would ethanol at 80oC boil, if atmospheric pressure were 900 torr? A solid melts at -50oC and boils at 75oC. What happens when heat is added to the solid at -80oC? a. 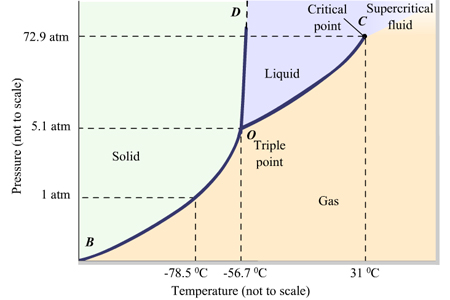 The temperature of the solid increases. b. Some solid melts as the temperature increases. c. Some solid melts, but the temperature remains the same. d. The temperature of the liquid increases. e. The liquid boils as the temperature increases. f. The liquid boils, but the temperature remains the same. What happens when heat is added to the solid at -50oC? The solid melts at the melting point of -50oC but the temperature remains the same. What happens when heat is added to the liquid at 75oC? The liquid will boil at the boiling point of 75oC but the temperature remains the same. c. because The water would boil vigorously and the temperature would increase. d. because adding more energy just makes the water boil faster. The temperature would remain the same. Once water reaches its boiling point the adding more heat will make it boil faster and evaporate faster. The temperature of the water will not change, instead water will go through as phase change from liquid to gas. Water exists as a solid, liquid, or gas? At 0.5 atm and -5oC, what is the phase? At 1 torr and 0.01oC, what is the phase? At what temperature does water boil at 0.5 atm? d. As the temperature drops from -30oC to a minus -80oC at 10 atm, carbon dioxide freezes.